He published his first article at the age of 13 and has been in journalism ever since. He often combined it with other jobs which ranged from umpiring baseball to managing sporting events to simultaneous interpreting. In the Soviet era, he mostly did sports journalism because it was an area where he could avoid political interference. Alexey has covered many major sporting events, including the Olympics. When perestroika took place, he moved into more general journalism and in 1990 joined Russia’s first ever independent radio station Echo of Moscow, where he was a news anchor and reporter. 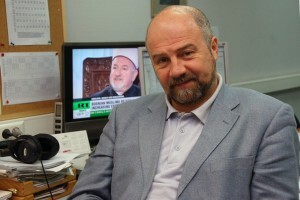 For this station he covered some of the decade’s most important events in Russia, including the 1991 August coup, the 1993 October violence and much more. Since 1994, he has mostly worked in television, including being one of key launch team members for the new national REN TV network. At the same time he continued his love of sports journalism and still writes frequently for national newspapers and magazines. He also becameRussia’s first golf commentator and still works in this capacity occasionally for Eurosport and Channel Sport. He is a winner of the prestigious Russian Journalists’ Union award “For Skillful Journalism” and also a few other professional awards. Alexey joined RT in 2005 and is now Managing Editor for the entire organization, including the English, Spanish and Arabic services. He has been married for 30 years and has two children and one granddaughter. His many hobbies include listening to classical music, going to art exhibitions, studying the history of Christianity and playing tennis and golf.